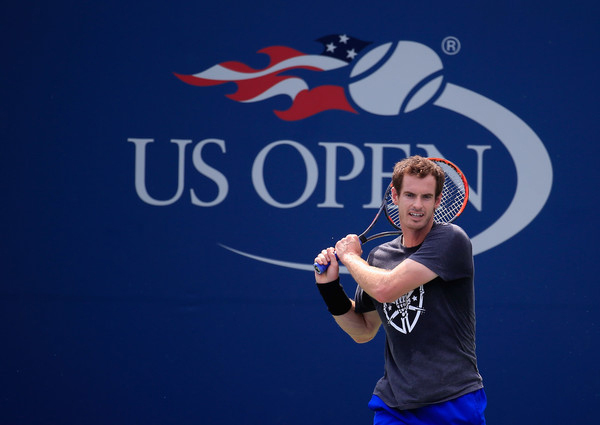 Andy Murray practices prior to the start of the 2016 US Open. Photo by Chris Trotman/Getty Images. It’s time for US Open tennis and I had so much fun attending in 2014 that I decided to go again this year. Unlike in 2014, when I knew I would be seeing Roger Federer play, I bought tickets for an evening session without knowing who will be on the court that night—it’s less expensive that way, I have found—but I am keeping my fingers crossed that I get to see one major player, either for the ladies or the men. Andy Murray is in the middle of an amazing summer, having won Wimbledon in July (so proud of him!) and being a back-to-back Olympic gold medal winner in Rio. I would love to get a chance to see him play in person! A 1967 floral brooch by Van Cleef & Arpels from the MMP collection. I weep! Photo courtesy of the Hillwood Estate. I was very excited to learn by browsing on the Hillwood Estate site that there will be a major exhibition of the jewelry owned by Marjorie Merriweather Post next summer called Spectacular! Gems and Jewelry from the Merriweather Post Collection. Hooray! Hillwood Estate is in Washington D.C. and was one of MMP’s many homes. This exhibit of her jewelry will cover almost sixty pieces once owned by the cereal heiress and businesswoman, from houses like Van Cleef & Arpels, Cartier, David Webb, and Verdura. One of the things I learned last year from the Van Cleef & Arpels lecture about Great American Jewelry collectors was that MMP gave a lot of her jewelry to museums. The jewelry writer Ruth Peltason, who moderated that night, even made light of it, “She kept giving things away!” Sure enough, the exhibit will include pieces still owned by MMP’s estate, as well as items that were once owned by her that will either be on loan from the museums she gave them to or from private collections. 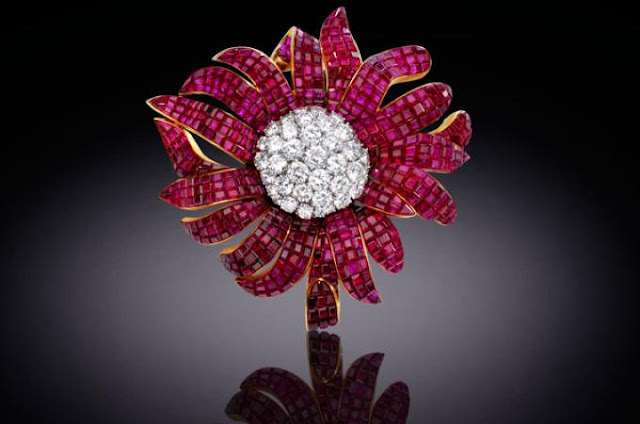 I do believe I saw some of her pieces in the 2011 exhibit Set in Style: The Jewelry of Van Cleef & Arpels, like the 1967 mystery-set ruby and diamond floral brooch, above, which MMP purchased in 1969, but I am thrilled to have another chance to see them in person and to view things I have only seen in books, such as her carved emerald and diamond brooch made by Cartier London in the 1920s. It is enormous! She wears it in the portrait with her daughter Dina. I love little Dina (who would grow up to become the actress Dina Merrill) in her yellow dress. Adorable! 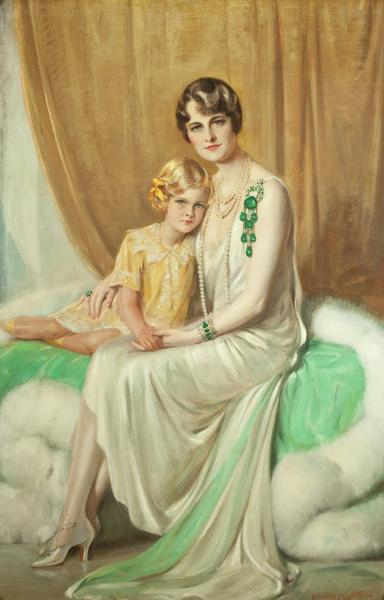 A portrait of MMP with her daughter, Dina. Speaking of yellow, the theme for September’s “How I Wear My” is devoted to that sunshine shade. I an normally not a big fan of that color for clothes, but a yellow dress that really caught my eye (and has stayed in my memory) is the Louis Vuitton gown worn by the lovely Alicia Vikander at the Academy Awards this past February. I thought she looked beautiful in it. Alicia Vikander in yellow at the Academy Awards 2016. Photo by Jason Merritt. I finally watched “The Danish Girl” last weekend and I understand why Alicia took home the Oscar for Best Supporting Actress. My definition of a worthy recipient of that award is an actress who steals every scene she is in and Alicia did just that! The movie was visually beautiful and very compelling. If you haven’t seen it, I highly recommend it! If you would like to join Adrienne and me for “How I Wear My: Yellow,” send your pictures to us at howiwearmy@yahoo.com by September 12, 2016. Enjoy your Labor Day Weekend and if you are headed out to Queens for the Open, let me know! The yellow gown on Alicia Vikander is just beautiful. Her performance as Gerda in the Danish Girl definitely warranted the best-supporting actress award. But shouldn't she have been nominated for best actress. She probably had a better shot at winning for supporting, though.